There are four main types of fats that we see in everyday life — each one comes with a handful of misconceptions and misinformation that has built up over the years. Saturated fats are typically demonized as the fat that causes heart disease, while vegetable oils usually get a free pass for being healthy. However, the truth is much more nuanced than this. 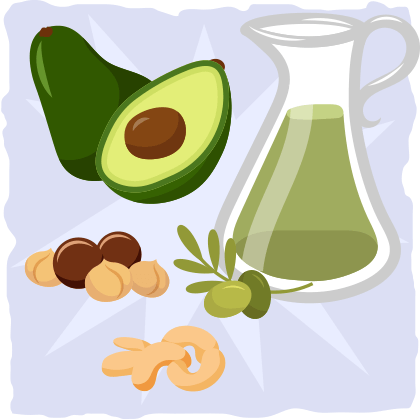 To be optimally healthy, we actually need varying quantities of different types of fats. Each one of these fats impacts our health in different ways, so let’s take a closer look each one and see how it applies to you, your diet, and your health. Saturated fats get their name from the fact that they consist of single-bonded carbon molecules that are completely “saturated” with hydrogen atoms. Different saturated fats are named based on the number of carbons molecules they have. For example, lauric acid (commonly found in coconut oil and breast milk) has 12 single-bonded carbon atoms, and stearic acid (commonly found in meat) has 18 single-bonded carbon atoms. Each one is a type of saturated fat, but they both have slightly different effects on our health (which we will learn more about later). Saturated fats are typically found in higher quantities in animal products while the other natural fats (monounsaturated and polyunsaturated fats) are usually found in higher quantities in plant-based foods. Over twenty years ago, government guidelines recommended that everyone consume a low-fat diet that limits saturated fat and cholesterol. Why such a strict recommendation for so many people? At first, we thought saturated fat and cholesterol would cause cholesterol levels to increase and plaque to build up in our arteries until we die of complications of heart disease. Now, however, we know that the truth is much more nuanced than what we originally believed. In general, saturated fats help keep your immune system healthy, your bone density normal, your testosterone levels in check, your heart beating, your HDL (“good”) cholesterol levels high — and, for the most part, are not associated with an increased risk of heart disease. The reason why I wrote “for the most part” is that there are many different types of saturated fats, and they all seem to have different effects on our health and cholesterol levels. This is where the nuance comes in. For instance, the current evidence suggests that caproic, caprylic, and capric fatty acids seem to have no effect on cholesterol levels along with antiviral, antibacterial, and ketogenic properties (i.e., they tend to be converted into ketones more quickly than any other fat). Conversely, lauric, myristic, and palmitic acids all seem to increase cholesterol levels in the same way (i.e., increasing both LDL and HDL cholesterol). Some studies indicate that myristic has the most cholesterol increasing potential, but the data is not conclusive. The only saturated fatty acid that has been found to decrease cholesterol levels and decrease plaque build up is stearic acid. As you can see, within the saturated fatty acid category alone, we have the potential to increase cholesterol levels, decrease cholesterol levels, or keep them the same. This is part of the reason why we can’t blame saturated fat for heart disease, and why many studies find no relationship between saturated fat and heart disease. But how does this apply to your keto diet? The first four fatty acids have been found to have no significant effect on cholesterol, while lauric, myristic, and palmitic acid all have been found to increase cholesterol levels. These three cholesterol-raising saturated fatty acids make up the majority of the saturated fats in the cheese (check out this study if you’d like to see the fatty acid data that I am using), so its safe to assume that cheddar cheese would cause at least a small increase in cholesterol levels, right? According to one study on cheese and butter consumption, the researchers found that cheese intake did not increase serum total or LDL (“bad”) cholesterol concentrations when compared with their normal diet — a diet which consisted of less total fat and saturated fat. In fact, the subjects experienced lower LDL, HDL, and total cholesterol levels when they followed the cheese intervention when compared to the butter intervention and the normal dieting period. The researchers speculated about why this was the case, but couldn’t come to any conclusion as to why the cheese intervention lead to similar or lower cholesterol numbers for the subjects than a normal diet period that consisted of less saturated fat consumption. Concentrated sources of lauric acid, myristic acid, and/or palmitic acid (e.g., butter, tallow, lard, coconut oil, and palm oil) are much more likely to raise cholesterol levels. However, these fats may raise LDL and HDL levels in a way that are actually healthy for some people (we will learn how to figure out if this is the case for you later in this article). Foods that contain saturated fat, as well as protein, fiber, calcium, antioxidants, and/or other health-promoting compounds, are likely to have a beneficial impact on your cholesterol levels, heart health, and overall health. Avoiding saturated fat is not the best way to prevent heart disease, especially if you want to optimize your health. The most practical advice I can give you regarding saturated fat consumption is not to fear them. Eating a burger or having an extra slab of butter will not clog your arteries. However, some people will notice their cholesterol shoot up to unhealthy levels when they increase their saturated fat consumption (due to specific genetic traits). To check if this is you, simply follow the ketogenic diet for 4-6 weeks and get your blood tested for a lipid panel. In general, you should make sure your total-to-HDL cholesterol ratio is getting lower with the dietary strategy that you are using. A ratio between 3 and 4 is good, and below 3.5 is ideal. If your ratio is significantly higher than before, then you may need to shift to a lower fat diet like paleo or a Meditteranean diet. When we combine the two unique traits these fats, we end up with the name “polyunsaturated fatty acids” which can roughly be translated to “many carbon double bonds in a hydrocarbon chain.” To figure out exactly what polyunsaturated fat a particular fatty acid is, we simply find where the double bonded carbon atoms are on the fatty acid chain and name it according to that. polyunsaturated fats, and not saturated fat. The reason behind this is polyunsaturated fats are much less stable than saturated fats and monounsaturated fats. Therefore, when they are in the bloodstream, they are much more vulnerable to becoming oxidized, damaging your arterial walls, and causing plaque build up. However, this doesn’t mean that you should avoid polyunsaturated fats altogether. Two of them are actually essential for optimal health: Omega-3s and Omega-6s. Omega-3s are long-chain polyunsaturated fats that are commonly found in high amounts in fatty fish like salmon and sardines. They are lauded for decreasing inflammation, lowering LDL cholesterol, and improving a variety of other risk factors for cardiovascular. To get the benefits of omega-3 fatty acids, the ideal dose is 0.5 to 1.8 grams per day of EPA + DHA from whole food sources like fatty fish. The reason why I recommended whole food sources of omega-3s is because fish oil and other omega-3 supplements tend become oxidized during processing which not only robs you of their benefits but also adds toxic compounds to your body that will impair your health. If you would like to learn more about omega 3s, check out this post. Omega-6s are essential for maintaining a healthy immune system and an optimal inflammatory response, but most of us get too much of it in our diets. The problem with consuming too many omega-6s is that they can increase inflammation to the point where it starts provoking heart disease and other health issues. For this reason, food items that are high in omega 6s (e.g., almonds, sunflower seeds, pumpkins seeds, processed foods, vegetable oil, sunflower oil, corn oil, soybean oil, and cottonseed oil) should be eaten sparingly. When you do consume omega 6s make sure they come from whole foods like nuts and seeds instead of fried foods, processed oils, or processed foods. For a closer look at omega-6s and how they affect our health, check out this article. Cut out all processed polyunsaturated fatty acids from your diet for best health. Meet your needs for omega 3s and omega 6s with natural polyunsaturated fats, and you will be able to optimize your heart health. Don’t eat too many omega 3s or omega 6s because they are only good for improving health and cholesterol levels when you consume them in moderation. Judging by how polyunsaturated and saturated fats are named, you can probably figure out what a monounsaturated fat is. Simply put, these fats have one double bond carbon atom. Thus, they are unsaturated with one double bond. Similar to polyunsaturated fats, we name monounsaturated fats based on where their double bond is found in its hydrocarbon chain. These fats are pretty well known and accepted to be healthy. Many studies show that monounsaturated fats can improve insulin resistance and optimize HDL/LDL cholesterol levels (via increasing HDL cholesterol and lowering LDL cholesterol). This is great news for anyone who is struggling with heart disease and/or type 2 diabetes. So far, I haven’t been able to find any negative side effect of consuming monounsaturated fatty acids that don’t apply to the other fatty acids as well. It also is much more stable than polyunsaturated fats and improves cholesterol levels much more reliably than saturated fats, so it is safe to say that this is a “healthy” fat that genuinely deserves its title. Trans fats hit the mainstream after we learned how to create them from an unnatural chemical modification, called hydrogenation, that allows them to have improved shelf life. This process completely changes the configuration of natural unsaturated fats in a way that changes how we digest and assimilate them — and all of these changes are negative. In other words, artificially produced trans fat creates the perfect storm for plaque build-up and heart disease. Your best bet is to avoid anything that has unnatural trans fats in it, or that has the word hydrogenated on the ingredients label. On the other hand, natural trans fats (like conjugated linoleic acid) that are found in red meat and dairy may actually be protective against heart disease and improve metabolic health. One of the biggest health-related fears today is how fat consumption will clog your arteries and cause heart disease. To dispel some of the most common misconceptions regarding fat, let’s take a closer look at cholesterol and heart disease. Cholesterol isn’t the mischievous compound that it is typically made out to be. In reality, it plays a crucial role in maintaining the health of our cells, and we can’t live without it. It only becomes a problem when the cholesterol particles are oxidized and start damaging your arterial walls. Before we dig any deeper, let’s go over the basics of cholesterol. HDL – These are High Density Lipoproteins and are essentially known as the “good guy.” They are responsible for transferring cholesterol from the body’s tissue into the liver to be broken down. You can think of HDL as your cardiovascular cleanup crew. LDL – These are Low Density Lipoproteins and are commonly known as the “bad guy.” Technically, this form of cholesterol isn’t bad. It actually helps bring essential nutrients to our cells once it leaves the liver. However, problems arise when these cholesterol particles oxidize due to interactions with other particles in the bloodstream. Eventually, these oxidized LDL particles will cause damage to the blood vessels that results in plaque buildup. It is also important to know that LDL particles come in different sizes. In general, small LDL particles tend to be much more susceptible to causing issues than large LDL particles. LDL Receptors — Present in the cell membranes of your liver cells and other cells throughout the body, these receptors are one of the primary drivers of how much LDL cholesterol stays in your blood. When these receptors are being fully expressed, you are less likely to have LDL cholesterol accumulate in the blood, become damaged, and cause plaque buildup. Triglycerides – This is the form that fat takes when it is being transported between tissues in the bloodstream. High triglycerides do not directly cause bad cholesterol levels, but they are an indicator that your cholesterol levels are not healthy. When you have a low LDL particle count, you can get away with having small LDL particles in your bloodstream, as there’s less “traffic” to avoid. When you have high LDL counts, you will have increased “traffic” in your bloodstream, increasing the chance of oxidization and damage to the cholesterol particle and arterial walls. When you have a low LDL count and large LDL particles, you will rarely have any issues. Your cholesterol can be moved easily throughout your bloodstream. We also have to take into account our triglycerides, as these are moving through our bloodstream as well. These guys take up some extra space, so if you have a high triglyceride count, you need a higher amount of LDL particles to move it around. With more LDL particles, we increase the number of issues that can occur. 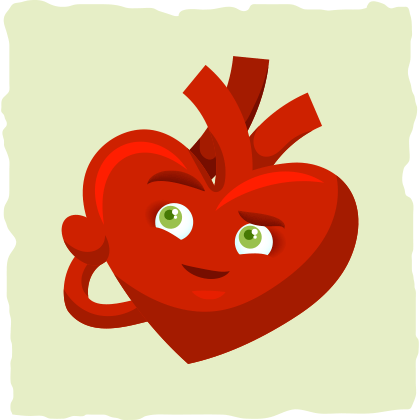 Blood sugar levels and carbohydrates also play a role in heart disease. High blood sugar levels tend to increase the likelihood that your LDL particles will become oxidized and start to damage your blood vessels. Studies have also shown that people on higher carb diets tend to have lower HDL levels and more risk factors for plaque build up in their blood vessels. On top of all of this, if your LDL receptors aren’t being fully expressed for some reason, then your LDL particles (regardless of how many of them or what size they are) are at a greater risk of oxidizing and damaging your arterial walls. Initially, the story we were told about cholesterol is that we must keep our LDL levels low or else we will have heart disease. However, after decades of research, we have found that many other factors matter much more when it comes to maintaining cardiovascular health. The size of your LDL particles plays a major role in whether or not it will become damaged and lead to plaque build-up. Your total to HDL cholesterol ratio is a much better predictor of your heart disease risk than LDL cholesterol. We should focus on optimizing LDL receptor expression to prevent plaque build-up. Keeping blood sugar and triglyceride levels low will decrease the risk that your LDL cholesterol will cause problems. Follow a low carb diet (like the keto diet) to optimize your blood sugar and triglyceride levels. This will help improve your cholesterol levels and decrease the risk of plaque accumulation at the same time. Eat an adequate amount of omega 3s, plenty of monounsaturated fats, eliminate all unnatural trans fats from your diet, and limit concentrated sources of saturated fats (if they increase your total to HDL cholesterol ratio). Decrease your inflammation levels by doing more low-intensity exercise, eating fewer omega 6 fats, eating more omega 3s, reducing stress levels, and eating more low carb vegetables. Eat more fiber. The best way to do this while you are on keto is by eating low carb vegetables and keto bread. Lose fat. Weight loss is one of the best ways to improve your overall health, decrease inflammation, and optimize almost every blood marker. The simplest way to find out how your diet is impacting your heart health is by getting a blood lipid panel done after around 4-6 weeks of following your new way of eating. The number that will give you the best indicator of your heart disease risk is your total-to-HDL cholesterol ratio. It should be between 3 and 4 (ideally below 3.5) to ensure healthy cholesterol levels and a substantially reduced risk of heart disease. How different fats affect our health is a remarkably complex topic. Each fatty acid category can be broken down into subcategories of more specific fats that each have different effects throughout the body. Plus, what these fats do to your health after ingestion depends on the food that contains these fats and the person who consumes them. For optimal health, we must consume saturated fats, polyunsaturated fats, and monounsaturated fats. Certain saturated fatty acids (i.e., lauric acid, myristic acid, and palmitic acid) can raise both HDL and LDL cholesterol levels. Other saturated fatty acids tend to have no impact on cholesterol and come with other health benefits (i.e., butyric acid, caproic acid, caprylic acid, and capric acid). Consuming moderate amounts of omega 3s and omega 6s are essential for optimal health and cholesterol levels. Processed polyunsaturated fats tend to contain too many omega 6s and oxidize easily, so they should be avoided. Monounsaturated fats are more stable than polyunsaturated fats and have many positive health effects including cholesterol level optimization. 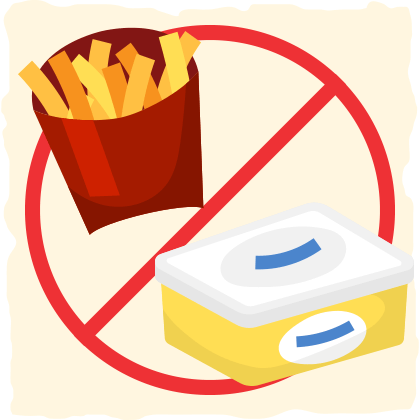 Unnatural trans fat consumption should be avoided because it will lead to unhealthy cholesterol levels. The best way to get your fats is with minimally-processed whole foods that have other minerals, vitamins, antioxidants, and macronutrients them. Follow a low carb, whole food based diet like the ketogenic diet. Eat plenty of fiber from low carb vegetables and keto bread. Decrease your stress levels by doing more low-intensity exercise, sleeping more, and meditating daily. Replace highly concentrated saturated fats (e.g., lard, butter, tallow, and coconut oil) with monounsaturated fats (e.g., avocados, macadamia nuts, and olives), omega 3s (e.g., fatty fish), and pasture raised meats, eggs, and hard cheeses if you find that a higher saturated fat diet is impairing your cholesterol levels. After you’ve implemented these suggestions for 4-6 weeks, get a blood test from your doctor so that you can check your blood lipids. If your total-to-HDL cholesterol ratio decreased and is now between 3 and 4, keeping doing what you are doing. On the other hand, if your numbers are out of whack after following the recommendations in this article, then you may need to follow a lower fat, whole food based diet to see if that is healthier for you. To learn more about cholesterol and how the keto diet affects your cholesterol levels, check out this article. 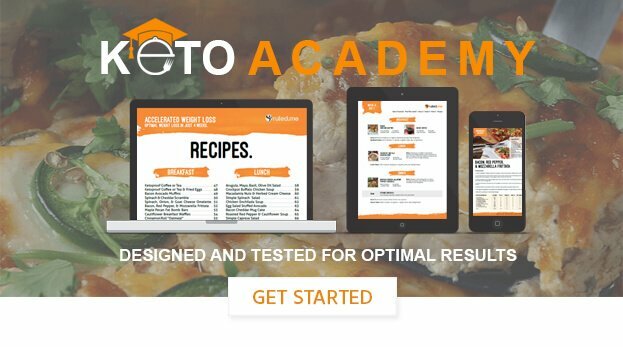 Or if you’d like to learn more about where you will be getting your fats from while you are following the keto diet, read through our keto food guide. Natural trans fats have health benefits, University of Alberta study shows — EurekAlert!